As you look to the year ahead, think about whether the most important people in your life may be celebrating a milestone. Is your mother turning 60? Are your sister and your brother-in-law celebrating their 25th wedding anniversary? Is your father finally retiring? If someone special is celebrating a milestone in the near future, it’s time to think about making Special Someone an album. Such a gift requires a little bit of planning, a lot of cooperation from Special Someone’s friends and a few hours to assemble an album, but the result will be worth every bit of effort. I made such an album last year for my mother-in-law, who turned 70. 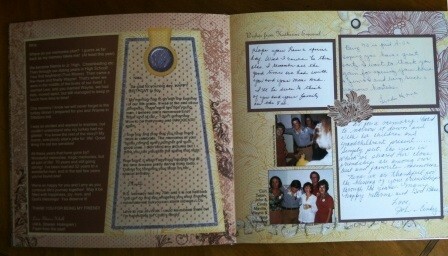 My husband and his brother hosted an open house for about 60 of her friends and family, and I made her a beautiful keepsake full of memories and birthday wishes for her to enjoy until her next milestone birthday. 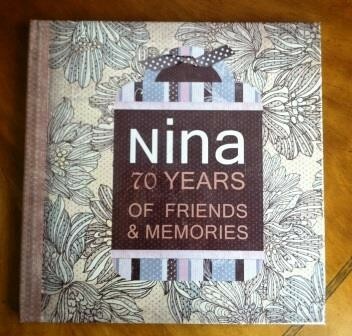 We’re creating a memory album for Special Someone to present to her at her birthday party. 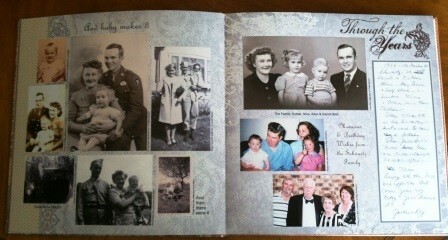 Please share a memory and/or photo of Special Someone so we can include it in the book. What to contribute: Send a message (a story, memory or birthday wishes) and/or photo(s) to Special Someone’s daughter-in-law, Album Creator. Email or snail mail accepted. If you can’t bear to part with a printed picture, mail it, we’ll scan it and send it back to you. Don’t delay! Send your message right now, while it’s fresh in your mind. About 15 invitees sent me something during the next 8 weeks. Don’t forget! If you want to contribute a memory, good wishes or a photo to Special Someone’s memory album, send it NO LATER THAN DATE to EMAIL or ADDRESS. Thanks to all those who’ve already contributed. A couple dozen more people responded, including my mother-in-law’s brother who had an abundance of photos. In my situation, the only people I had to bug to contribute were my mother-in-law’s 20something grandchildren. Typed and handwritten messages side by side. 3. 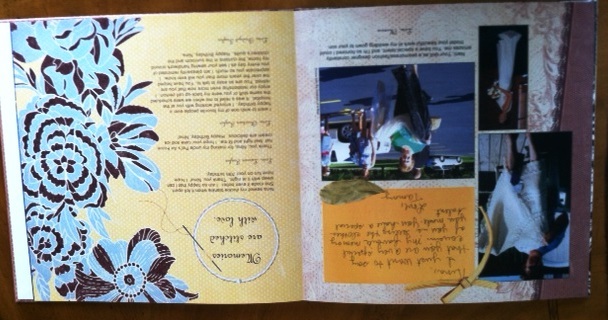 Decide format: I scanned all hard copies (including handwritten notes) so I could create a digital photo book. 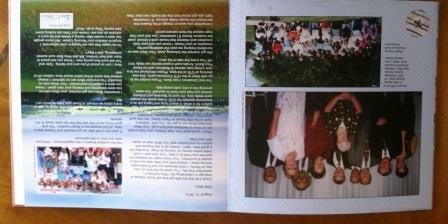 I chose to print with Shutterfly because of its fast service (when complete, the album was delivered within a week). 4. Select a design: One theme throughout a book ties different subjects together, so I recommend sticking to one color scheme or coordinating designs. Here, using a classic background, black and white images blended beautifully with color images on other pages. 5. Organize: I used a roughly chronological approach to the album, so friends from high school (with pictures of high school) went in the beginning, messages from her card club friends in her current life went in the middle and messages from her grandchildren went at the end. It wasn’t perfectly chronological though; images of she and her brother were near the beginning, whether they were toddlers or retirees at the time. I tried to put similar people together on the same pages (co-workers, for example, and aunts). I got a lot of family reunion photos (because, of course, that’s one of the places Special Someone often sees those who contribute to such an album, so I grouped them together here with an image in the background of South Dakota, where many relatives live(d). 6. Print and present: We put my mother-in-law’s album on display at her party so all the contributors could see their own contributions and others’ in print. But we presented the album to her a couple of days before so she could absorb all the wonderful things people said about her and remain composed at the party. 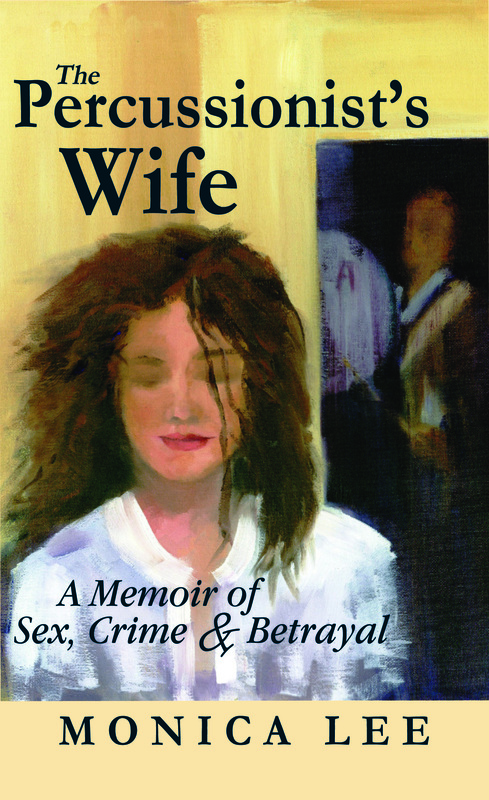 In the end, her book was 50 pages long and covered almost every important achievement and person in her life. One life. One book. Amazing. This entry was posted in Gifts, Shutterfly, Uncategorized and tagged Digital Scrapbooking, Gifts. Love your book!! 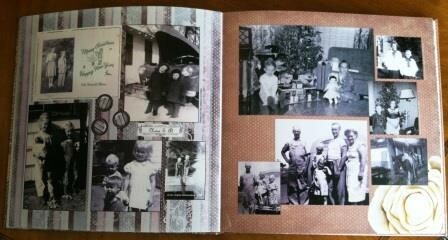 Several years ago, I made a scrapbook for my Mom’s 90th Birthday!! I didn’t think of using Shutterfly (I should have, since I get my photos to use on my photo cards from them), but my Mom loved it..reading the notes from friends and family and seeing the photos they sent!! My sister and I also made a video with all our photos…and a song my sister wrote, and sang…lovely!! My Mom’s in Heaven now, so we’re sooo blessed to have been able to make one of her last memories so special! !